First, the back story. 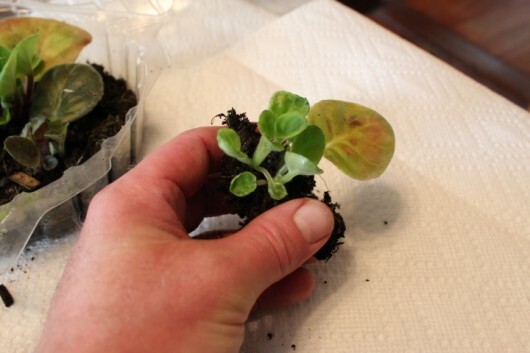 On November 27, 2012, I snipped off five leaves from various plants. The leaves were then inserted in damp potting mix that I poured into a Boston lettuce tub. The tub provided a pleasantly-humid environment for the cuttings. So humid, in fact, that I did not have to water the soil until the babies emerged. By February 13, each leaf had sprouted a number of offspring. I posted the above photograph on Facebook that day, with the caption “Pass the cigars — I’m a daddy!” You see, even after 40 years of propagating African violets, I still get a thrill when little plantlets spring forth. Probably I need to get out more. I let the babies grow for several more weeks until they were large enough to handle. True, the mother leaves started to deteriorate during this time. But the youngsters grew and grew. Make no mistake — there is never, in my experience, “just one” baby attached to a parent leaf. The above leaf gave birth to twins. And she would have produced triplets, quintuplets, or even octuplets if I’d left her in the soil longer. Consequently, look carefully to determine how many rosettes of leaves are evident. Each rosette is a complete plant. To separate the rosettes, cut between them with scissors or a sharp knife — a pen-knife works well — as illustrated above. Now select a pot with drainage holes for each young plant. The pot must be no larger than 2 inches in diameter. Why? 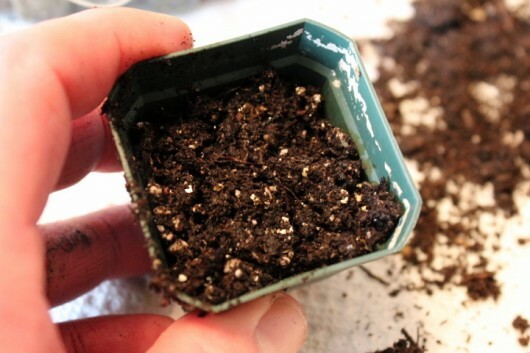 Because a larger container will hold too much soil. Too much damp soil around a small root system can lead to root-rot. For today’s African violet adventure, I used both clay and plastic pots. Fill the pot with any damp, well-draining medium. A 50/50 blend of leaf mold and perlite will suffice, as will any commercial peat and perlite formula. You do not need a special “African violet” potting mix. Be sure to leave a 1/2-inch opening between the surface of the mix and the rim of the pot to allow for water. 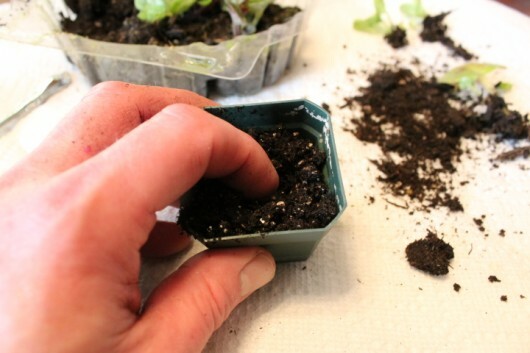 To accommodate roots, use your finger to make an indentation in the center of the pot. Next, insert the rosette, adding a little more mixture to cover roots. Then firm the medium gently. As you can see, I achieved 11 new plants from my propagation efforts. These will not need larger pots until their leaf-span grows to three times the diameter of the pot. And there are more youngsters to come. 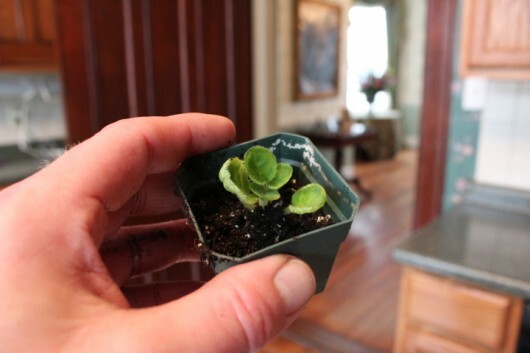 But they are too small for potting. I returned the parent and child pictured up top to the Boston lettuce terrarium. You will find that African violet babies flourish much faster if you give them plentiful light and humidity. My plants reside on fluorescent-lit shelves in my Writing Room. To provide a humid atmosphere, I set them in make-shift terrariums. While others were given comfortable quarters in a clear plastic food-storage container with a lid. Sealed in such containers, the plants won’t require water for at least one month. However, their time in the rain-forest must be limited. After four weeks have passed, remove the lids for increasingly-longer periods each day. 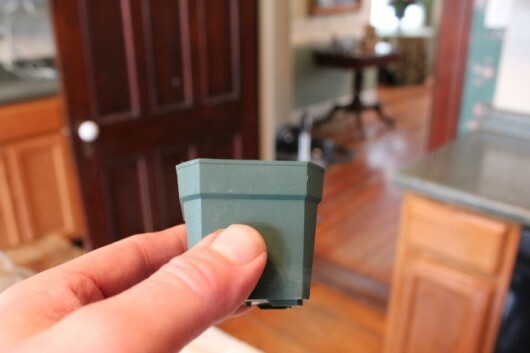 This way, the plants can adapt to the level of humidity your home affords. When will they flower? If you give them the care I described in an earlier post, you can expect constant bloom in as little as 6-9 months. Was this tutorial helpful to you in some small way? Perhaps you can let me know by leaving a comment. I tried rooting some…..but the leaves just keep withering away, with no sign of babies??. Hi Cindy G – Did you plant the leaves in a terrarium or some kind? Especially in winter, they require lots of humidity in order to root and produce offspring. Kevin, I need to stop reading your posts about house plants – this really badly makes me want to go out and get some african violets, RIGHT NOW. Hehehhe! Well, first I need to build the window shelving for my bathroom… Gotta have a home ready for the beauties! Well, my thumb must be brown because around Nov/Dec I repotted a violet and planted about a dozen leaves in a lettuce terrarium and all that has happened is rotted leaves. I had even dusted the stems with root hormone. The leaves stayed green for a good 10 weeks but have started wilting and turning to mush. The reason for a repot was to cut off two suckers (thanks for your help on that), mother plant and suckers are all doing well. Don’t know what went wrong with the leaves. Could temperature be an issue? The terrarium sits on a window sill and it has been a cold winter, but the other three plants are there as well and seem not to be bothered. 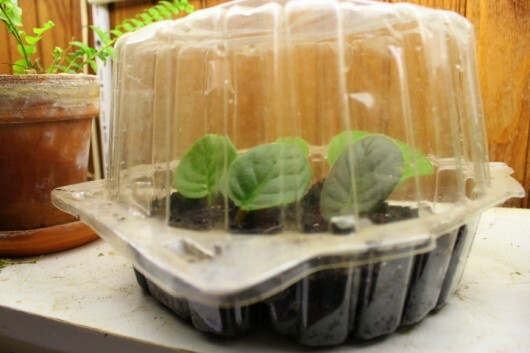 What a great idea to use the lettuce tubs! I have some of my winter sowing seeds in the tubs. I did just pot some leaves and put in a pot and then put a ziplock bag around it and zipped it shut. I hope this will work! I’ve started many baby African violets with much success, however, I love your suggestion of using lettuce containers as mini terrariums. Can’t wait to try those! Thanks for all your great ideas! Very helpful, thank you! I was given leaves and told to put them in water to root, no such luck! I will try your terrarium method. Love African violets! Very informative Kevin!!! You give me the “I think I can” to try so many things!!!! These babies are going to be beautiful!!! Hi Kevin. Two quick questions. Are the flowers of the babies the same as the parent plant? Do you fertilize all year or stop October through March? As always, thanks for your website and insight. Your tutorial is very helpful, Kevin! I am staring at the 13 plants on my Victorian violet stand, know that several need to be divided, and in the process certainly several leaves will be available for propogating! I’ve liked how your previous posts reminded me the value of giving plants a rotation under fluorescent lights. I haven’t done that, but have plenty of (currently) unoccupied light fixtures in the basement. Perhaps TODAY I will divide and propogate one of the violets and see how it goes. Thanks for the inspiration! Hi Valerie – Yes, the flowers of the baby will be the same as the parent plant. My African-violet feeding-routine is described in this post. 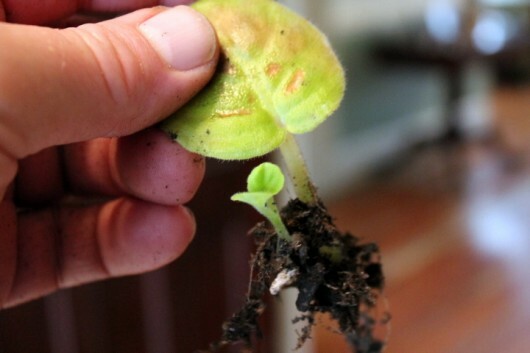 I just did this with coleus and have high hopes for transplanting them outside this spring. I’m also trying a bunch of perennials using your milk jug greenhouse. I think I’ll do African violets today. Do they need to be dead headed? Thanks for the step by step. I must water mine too much. Should the soil always be moist around adult plants or allowed to dry out? For yrs. I have propagated my African Violets. When we lived up north, I did them in the basement under florescent lighting and it worked great, damp basement, lighting and all. Now down in the south, no basement nor florescent lights, I have had difficulty in doing so, never thinking of doing them they way you have instructed. Just this morning, I repotted many plants to a pot size bigger, jade tree, etc. then opened this and I am doing this immediately!! I used to have 20+ violets, now only 3, but all that WILL change now. Thank you so much for these great tips!! I always look forward to the tips you send out!!! OPPS!! Forgot to post my website. We are in process of setting up a pay pal acct. to make donations more readily available. AND forgot to tell you, every yrs. I had a yard sale in spring and SO many ppl came every yr. just to buy the Violets I propagated during the winter. Our last 1 was to move south and so many ppl were so disappointed to hear I was leaving, because I have 4 large tables set up and started every type of plant I could propagated!! I have tried larger plants, with scraping a piece of the stalk and using a wet guaze to grow the roots, but as of this time, I have never been able to accomplish that 1!! Any tips? Having attempted propogation of AV in the past, the one thing that caught my eye today is that you add an additional light source (flourescent-lit shelves) to your system. Is the light-of-day by a window not enough for this process? Would it help to place a heating pad under the plants during propogation? 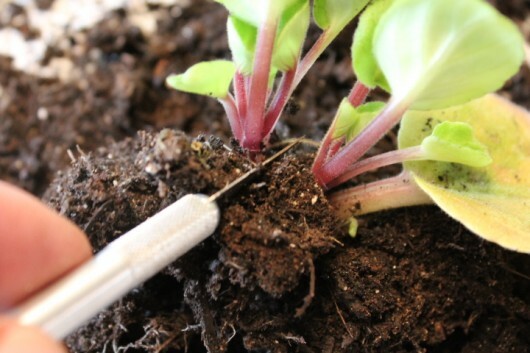 Does it help to dip the stem (of the donor leaf) in rooting hormone prior to setting it in the soil? Love your newsletters and style of writing. Thank you!! I have heard to pinch off the leaves in the middle of the plant for propagating. This does work well, as the leaves are not limp, like some of the bottom leaves. Love your site and all the tips. Funny to see all the women on the comments and no men. I’m changing that. Years ago my wife had all kinds of African Violets but hasn’t had for years and I love the color they bring into the house. I’m retired now so I get to garden more like I want and African Violets will be just one of the items I will be growing. Thanks for your info on how to go about it. Have tried in the past to divide my violets without success and now I know why, was just doing word of mouth and now have seen a much better way. Thanks for the help!!!!! Dave, What perfect timing when I saw your info today about propagating African Violets. I have one that I was just thinking about doing some leaf starts. Going to give it a try and see how it works. Got the plant from a good friend and I want to keep it going. Love your website! I guess you don’t ever sleep! I know myself there are never enough hours in a day. Thank you. Love this. I think I can do this. Thank you. Kevin, I have some violets that belonged to my mother, which I inherited when she passed, Some of them are over 20 years old and have grown up out of the dirt with a long stalk. I tried repotting them and broke off part of the long root. They are growing well, almost too well. Some of them are over a foot across and very “leggy”. Is there anyway to get them to grow more compact like your’s are? Thanks for the tips… yours are always great!!! Very much appreciated, Keven! I’ll give this a shot one of these days.. I have nurtured so many baby AF’s over the years with greater and lesser success. 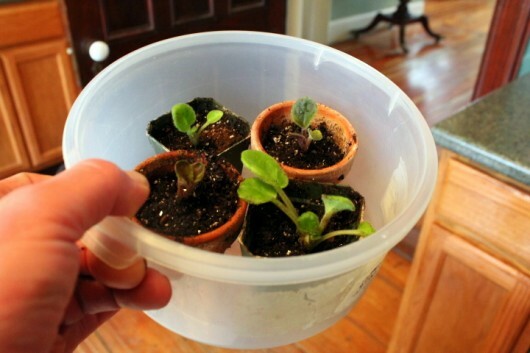 Two tips that I find useful from this tutorial are to gradually aclimate the babies to the less humid air of your house and to not pot in too big a pot before they have become quite a bit larger plants. I will incorporate those suggestions into my propagating routine. Have you ever propagated AF’s by pollination and seeds? I have been curious to know if I could do it. I tried once, but I didn’t get any seeds. wwo – A great source for beautiful African violets is Lyndon Lyon Greenhouses. You can read more about the arch in the entrance (and see details of the piece) by joining me on this house tour. I always had African Violets as a child, inspired by my grandmother. An thanks to you, I have purchased another for my home. Thank you for getting me started again! Your tutorials are always so well-done. I, too, was inspired by my grandmother to grow African Violets. I still love them. Thank you! Can’t wait to try it, and read your other posts on AVs. Would have been a little concerned about the health of some of those mama leaves. Looks like you had the plague! There’s a spot virus spreading like wildfire to be aware of. I LOVE that you use these plastic containers! They are so cleverly designed! I save them and use them for all kinds of stuff too! when you propagate a leaf, and it grows babies, and when it gets bigger and blooms again, does it bloom the same color as the parent plant? Carol – Yes – the babies are exactly the same as the parent plant. I’m starting two different leaves from different plants today. I hope they do what they are suppose to do! *Next Question, when they are inside the bag, is it okay for the leaves to touch the bag? I heard before that it is bad for the leaves to touch anything. Also, how often should they be watered ? Hi Carol – It’s best to keep the leaves from touching the bag. Water just enough to keep the soil moist, but never saturated. 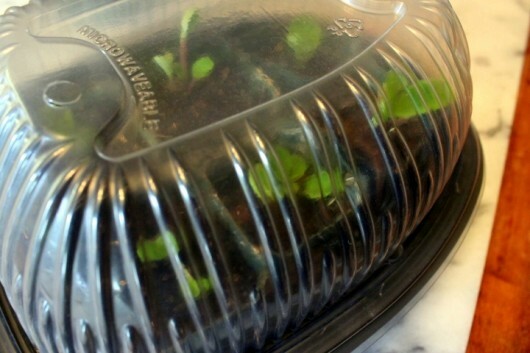 Sealed in a bag or another type of “greenhouse,” you won’t have to water for many weeks — probably not until the babies emerge. Provide bright light but no direct sun during the propagation period. Alright, Thanks! I have them in 2 in. pots inside a butter container that is inside a Gal. zip lock bag, the butter container holds the bag away from the leaves. It seems so easy, but I really want this to work!! Kevin; What have you determined from your plantlets in clay pots? Does mold ever grow in that moist environment? I started some leaves I started several leaves just one week ago and they have soft white, hairy stuff growing on the soil. I scooped it out and have left the lid off to dry the environment a little. Once I have separated the babies…do i need to, Do I have to add a rooting power ? Nice to meet you, Candee. I don’t use rooting powder for African violets (or any other plants). Once I’ve separated the babies, I discard the parent leaf. As for soil, I pot the babies in the moist, well-draining mixture described above. More African violet “how-to” in this article. Barbara – Congratulations to you! Thanks so much for the very helpful tutorial. I was given a violet when a friend moved away & it has been thriving in my kitchen window. When i saw this post I was inspired to give propagating a try. Here goes! I’m starting to see babies from my mother leaf. I’m curious to know, why do you have to separate the babies from the leaf? What would happen if you just leave mother and babies in the same flower pot? Gosh, with your photos and tuitorial, I would like to try to grow some AV..now to raid somebody’s recycle container for that type of container or maybe I can convince the Deli mgr. to sell me one complete set. Wait a minute, I just threw a clear container with lid in the recycle bin that had yogurt pretzels in it. Can I use that? Do you poke any holes in the top for air circulation like you do the wintersowing milk jugs? I will be looking for a pretty AV in grocery store or nursery to grow and start from there. My sister usually has good luck growing them, maybe I can entice her to let me take a cutting from hers. Exactly what do you mean by leaf mold? Is it just shredded leaves? Ordered 25 leaves on eBay and she sent 54. I have babies coming up tp my elbows! Mine rot or die of fungus if I water from the top. Used old brownie pans and set 2 inch terra cotta pots then flood the pan using warm water. I heard somewhere, wet feet and dry ears. I have been nursing these for 5 1/2 months. Still learning about different ways to propagate, force bulbs and have been gardening for over 25 years. Your blog gives me lots of tips to try different things. Thank for the information. Hi Kevin, in December, I clipped 6 leaves , potted them per your instructions- no babies but lots of moss on top of soil. the mother leaves are still green and in good shape. any ideas? You can be the proud gardenfather of my new African Violet babies! From December, the 6 leaf cuttings produced clusters of babies as you said. I will wait a few more weeks, then will separate , pot and give to responsible family/ friends. Thanks so much for the concise tutorials.;-))). Yours has been the simplest tutorial yet. I so enjoy not feeling like I need a PHD to do this my babies are starting to sprout, now I know what to do. This Violet thanks you, and my Violet plants thank you. Guess what everyone is getting for mother’s day next year. LOL! I was just about to throw out the mother leaf…because it looked so sickly….that I discovered one baby seedling next to it. A miracle in my eyes! Now, to let the seedling grow some more before separating from the mother leaf. Patience truly is a virtue. It took about 3 months. When I was not seeing anything for a about 2 months, I then moved the mother leaf under a GLASS terrarium near plenty of sun (I previously just had it in a sunny location). Lots of condensation had built up and the glass is very warm to the touch. This to be the perfect condition for the baby to emerge. Now I know why they are called AFRICAN violets! 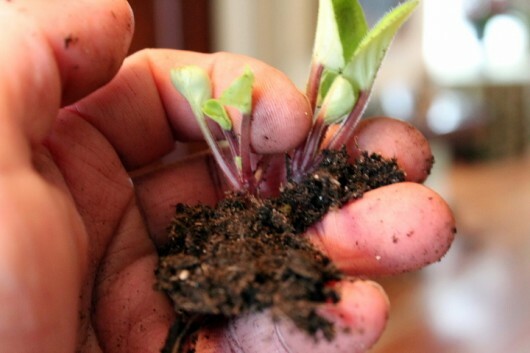 Following your tutorial (and having plenty of patience)….the key to successful baby plants. Thank you! Should I assume that I can separate a baby from the large parent the same way you separate the new grown babies? I noticed today when I was deadheading my violets that there was a baby. By the way just wanted to let you know that I have had fairly good luck starting babies in a small green glass of water. I have one blooming right now that I started in this fashion. Learned this from my gram who loved violets! Thanks for all the good info.! Hi Kevin! I followed your tips for propagating African Violets starting a few months ago. I had one plant that had morphed itself into three. When I finally separated the plants into their own pots a couple of leaves fell off. Well, I just happened to have a container of hydroponic lettuce in the fridge, so I transferred the lettuce to a bag and set up the container as a terrarium, stuck the leaves in, and bided my time. I was starting to think nothing was going to happen when one day (three months later) I noticed an extra spot of green through the container lid! I was so excited that it actually worked I could hardly stand myself! So I’ll wait a few more weeks for them to grow a bit bigger then transfer them to their own pots. 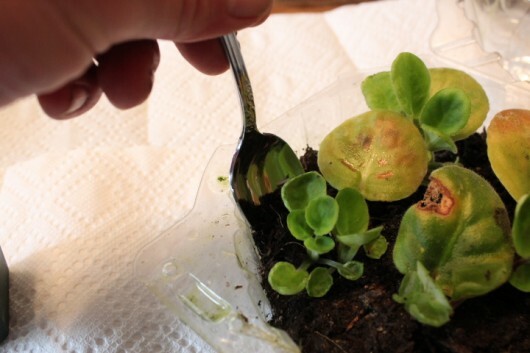 So thank you for this post, I’m so happy I can create my own African Violets now! WOW! That is a excellent educational quickie about propagating African violets. My Adult African Violet, Viola, has spawned babies. How do I take the ‘babies’ off of the ‘mother plant’. I want to pot up each and all of Viola’s babies. I certainly don’t want to kill any of the babies; also, if possible, I’d like to save the Mother Plant, Viola! Please help me save all of them! What more can you say. You did an excellant job and giving instructions on how to root them. The only thing I didn’t do was to seperate the leaves. Can I leave them with all those leaves left on the big leaves? Its doing so good I hate to touch them. Thanks for the info. 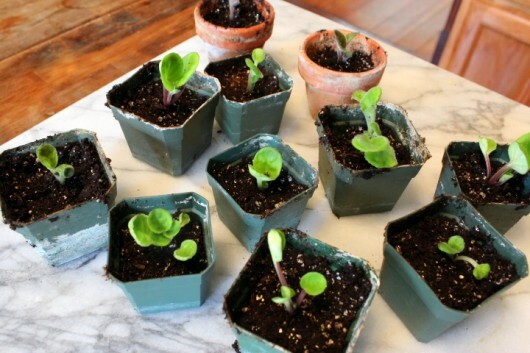 Where can I find W I D E R- not deeper clay pots for my African Violets? Hi Marian- Any garden center worth its salt will have shallow, 4-inch pots. Hi Pat – If you don’t wish to put your thanksgiving cactus into a larger pot, then do the following: Knock the plant from its pot, remove half the roots, and half the foliage. Then repot into the same pot, filling in with fresh soil mixture. This is standard practice for most houseplants — even African violets. please help me..im new to plants and barely have a vocabulary to understand dry rot or other terms with plants..but im trying so hard. 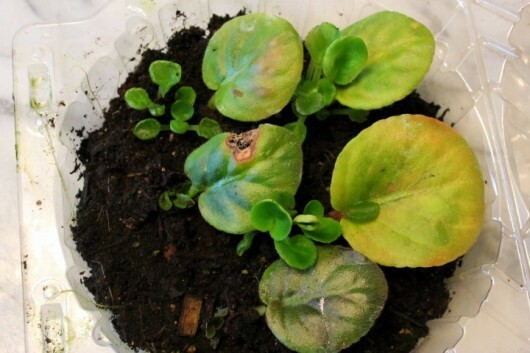 i made 9 african violet babies from a mother leaf…8 worked and baby tiny leaves started to grow..
Hi Annie – Thanks for writing. Best plan is to separate the youngsters, and re-plant them in 2-inch pots as described above. I can travel up to 3 wks, and trust my Violets to have sufficient water. Depot.. A non glazed pot sits inside another pot, glazed on the outside. There are No holes in pots, . Water and Eveylns VF-ll fertilizer go into the bottom pot. I only use Northwestern light. Plants were 30 inches across. Compact blooms up to 8 in. Now have to separate. I do not have time to water every week, and this really has solved my dilemna. Great help. I have a nursery-in-a-lettuce-tub just idling. I think it needs more light. Also, just transplanted 9 plants that were started from mother plant 6 months ago. Going to your post about getting them to flower next. Thanks for the clear info. This is a great website! I have had wonderful success following your directions, and my African violet has been blooming continuously for almost a year. I also took the plunge to make babies. I started the leaves in May and two have already given birth! However, one has the babies growing out of the BACK of the mother leaf! I did not see this in any of your pictures. They appear to be growing out of the leaf itself. Any suggestions for how to handle these little outlaws? Hi Jennifer – Glad to hear of your success. African violet babies can form all around the mother leaf. Give ’em all the same amount of love! 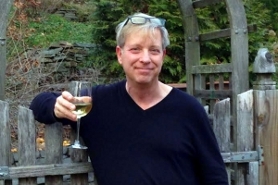 I love to read your garden articles – particularly your indoor gardening. Could you do a post about your room with lighted shelves? I’ve caught brief glimpses of shelving with lights, but I’d really like to know more about them. I’d like to install my own at home. Really, really enjoy your blog! 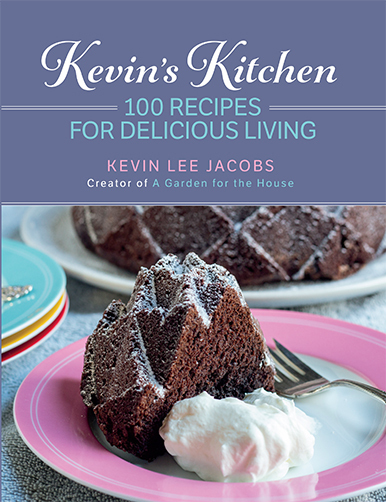 *All of the ideas I read from Kevin, pretty much always work and that is very unusual. Love this piece!!! Love African Violets… a thing I picked up from my grandmother 50 years ago or more (I’m of grandmother age now myself). So here’s my story about African Violets…… In the 1970’s (way before Starbucks) I had a dessert shop in a college town. We served cappuccino & espresso before anyone knew to ask for them. Anyway, I had a little vase of fresh flowers on each table but, on romantic dates, guys would take a flower from the vase to give to his lady love. Seemed harmless if only one person took a flower but by night’s end, I was left with empty vases. Everyone was doing it. “I’ll get plants!” I thought. That will solve the problem! African Violets were my plants of choice so I got a big, beautiful plant for each table. Well, other people thought they were beautiful, too because now, instead of the young lovers removing blossoms from my vases, the blue haired ladies started pinching leaves to start their own beautiful plants. You guessed it, MY beautiful plants turned to sticks. You don’t want to hear the rest of the story……. Hi Kevin- just found your blog and am very excited to try propagating my one AV that I received as a gift. Question: I have an indoor pool. Do u think the one that I received as a gift will do well in there? 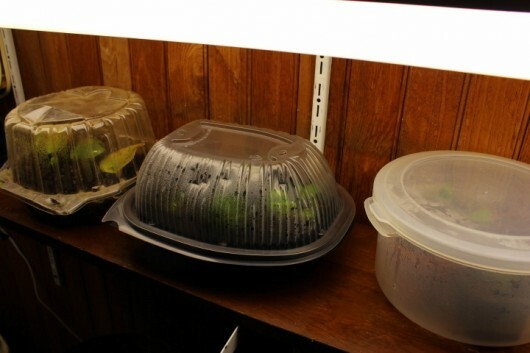 I’m still plan to use your lettuce holder idea to start the new plants and hope it works for me. I also put my huge geranium plants in the pool room last night because the temperature went to 29 degrees already at night. I’d like to keep them blooming if possible. A very helpful article! Thanks for the tip on using lettuce containers to start the babies. I ordered leaves this past Spring and have nurtured them all Spring and Summer. Once the babies came I potted them in the small pots like you suggested. All looked good and I had big dreams of beautiful violets. But a week or so into the new African violet soil the babies started looking sickly. Several of them just turned to mush. Here it is like 5 months into my adventure and now all of the babies are turning into mush. That African Violet soil just does not look right – it always Looks wet – but I am not watering that much? Kevin, I am heart-broken as this is my first time ordering leaves and having them grow so beautiful to start with -only to have them turn to mush when put into this African violet soil? Do you think this could be my problem- ? Plus, at first I only watered from the bottom of the little pots. A couple of weeks into the new pots white stuff seemed to be growing on top of the soil so two weeks later when I watered I watered from the top trying to flush that stuff away? Do you have any idea what is going on? Kevin, I’ve had some experience with the flowers being a different color or changing into ruffled flowers or doubles. Any insight? This was great! I’m a new grower and it helped me a good deal to see how to separate the babies from the mother leaf. Thanks a bunch!!! Hi Kevin, all I need to know is should I pinch or cut off dead flowers? They aren’t pretty! Thank you! Hi Diane – By all means remove the dead flowers. Very helpful article. At this time I have leaves rooting in water and several baby plants growing in perlite and soil mix. I recently took babies off a mother plants but they didn’t have any roots. I put in vermiculite and they all died. Any suggestions. Or was it just bad luck. I’ve had some success with root babies just starting in water and then moving to self-watering tiny pots. I can’t wait to try this on a MASSIVE scale! I take in AVs here at the office from friends who have a hard time with them, fix them and return ’em. Think I’ll charge ’em a leaf for my services now that you’ve shown me how to propagate on a larger scale. Thanks! I love African Violets and I have two babies outside of the window ledge (we’re in South East Queensland) which makes me think I’m neglecting them. I love the terrarium method! Will use that next time. Thanks for posting.. happy African Violeting! HI Kevin…I don’t know what’s happening with my African violets 🙁 I’ve always had good luck with them, however over the past year they aren’t happy. I have them in a western exposed window. I water them once a week, careful not to over water, I also feed them African violet food. They aren’t blooming like they used to or should I say not at all! Hi Ronnie – Here’s my best advice: Give your African violets the “blossom booster” food I described in this post: African Violets: How to Achieve Constant Bloom. If all other cultural conditions are satisfactory (i.e., light, humidity, etc. ), your plants should reward your efforts by forming flower buds in 2 or 3 weeks time. Exactly the information I was looking for!! I have new babies that are ready to separate and needed your information on how to do this. Yay! Babies are moving later today! HI! I found your blog via a search for African violets…and ended up making Angelic (truly) Zucchini Fritters tonight – dee-lish!! No sour cream in fridge and at first bite they reminded me of potato pancakes and the applesauce did the trick for a dip. Thank you so much! I might make them once a week, rest of season. 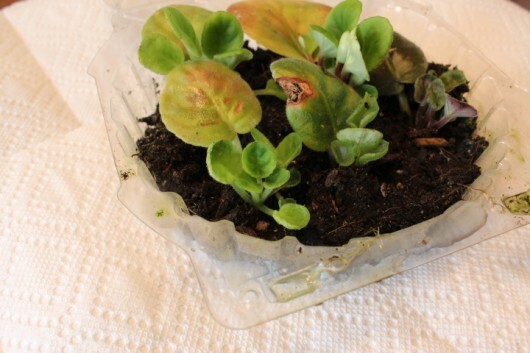 Oh, and violet babies are in a plastic container already. Thank you for info – I planted a bunch of new baby plants in small medicine cups -some withered away but a few lived and look great. I see you said when the leaves grow three times the diameter of pot to replant in bigger pot. I’d love to see a photo of that stage if you have one just so I can be sure it’s time! Hello! Thank you for info – I planted a bunch of new baby plants in small medicine cups -some withered away but a few lived and look great. Not sure when to replant….I see you said when the leaves grow three times the diameter of pot to replant in bigger pot. I’d love to see a photo of that stage if you have one just so I can be sure it’s time! What do you suggest to do in order to keep a large leafed African violet that was once a single crown that I transplanted and is now trailing? It has Beautiful blooms but it trails. Kevin, Just came across your site. I have just been given 4 African Violets and i just finished reading a book on them, I learned more from you !!!! Love your photos…. We have a wildlife habital/Zen garden with a koi pond. My grandmother always had African violets , and this is my first time trying them. I really learned a lot from you . Thanks so much . The photos really help. What s a neck ???? I read something about removing a neck from the Violets ? I learned from my mom, back in the 50’s, how to start African Violets from leaves. She always cut a healthy leaf and suspended it into an aluminum foil covered glass of water. The foil would keep the leaf out of water but let the stem throw out roots. We could watch those roots grow as the glass sat on a well lit window sill. Thanks for the idea of a rotisserie chicken terrarium for the babies! I have these 2 AV which I bought in grocery store they are flowering and they really look good, but i noticed many babies. How can I separate these babies to mother plants w/o breaking or harming the beautiful flowers. Thank you for this tutorial! 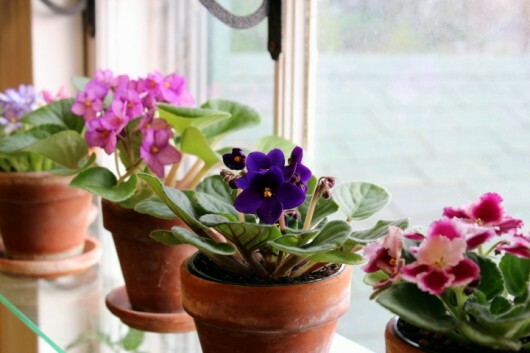 I’ve rooted African violets most of my life, but I still learned a bunch from this how-to.